← Welcome to Lebanon; now part of Iran. On tuesday two hundred students attended SOAS to hear Gilbert Achcar, a Professor of International Relations at SOAS, talk about his new book The Arabs and the Holocaust: the Arab-Israeli War of Narratives. 1. The Arabs bear no responsibility at all for the Holocaust. 2. The Israelis have Nazified the Palestinian people. 3. This Nazification has come about by Israel’s broadcasting of the Mufti’s connections with Hitler during WW2. 4. The Israelis must apologise for the Nakba (the Palestinian catastrophe of 1948) for there to be peace. 5. The Israelis are today still frozen with fear by Holocaust. 6. Any anti-Semitism and Holocaust denial in the Arab world is purely a result of Israel’s aggression or Israel’s societal shift to the right. Arab – Israel is a Zionist colonial enterprise where the “ethnic cleansing” of 1948 was a defining moment. The expansion of this colonial state continued after the 1967 war and continues to this day with the oppression of the Palestinians on the West Bank and in Gaza. Israeli – Zionism was a response to anti-Semitism and Israel was created as redemption for the Holocaust. The Arabs are like the Nazis. There was no ethnic cleansing of the Palestinians and the 1948 War was purely a defensive one. Achcar didn’t refute the Arab narrative but did refute the Israeli one. He said that there had been a total lack of sympathy with Nazism throughout the Arab world and no military actions were undertaken by the Arabs with the Axis powers but Israel needs to acknowledge its role in the Nakba and its oppression of the Palestinians. Meanwhile, Arabs must acknowledge the role of the Holocaust on the Israeli psyche. Next to speak was Palestinian author and journalist Nur Masalha. Masalha said “we are not responsible for the Holocaust. We are its indirect victims. We paid for the Holocaust and we are still paying for it. The Jews were its victims but we are also its victims. We are the Jews of the Jews. We have become the Jews of history” and he spoke of “concentration camps in Gaza”. He claimed the Mufti was not an anti-Semite and that as Jews and Muslims had fought in several wars together this was proof that there was no history of anti-Semitism in the Middle East. He thought that a Holocaust denier in France would go to prison and in the UK would lose his job but if you deny the Nakba in the UK, like the current Chief Rabbi did, you go to the House of Lords. Last to speak was Idith Zertal of the Institute for Jewish Studies, University of Basel. Again we heard that the Arabs had nothing to do with the Holocaust. She said that too much had been said about the Mufti and that the Palestinians are the scapegoats of the Israelis. She also felt that Israelis are so helpless in the face of such an event like the Holocaust, and how it was allowed to happen, that Israelis are transferring their rage onto the Palestinians. She said that even the Poles share in this Israeli “rage” because as so many Israeli youngsters visit Auschwitz they think the Poles exterminated the Jews. How I wished for a Melanie Phillips or a Geoffrey Alderman to be on the panel. The audience asked the usual banal questions including on the prospect of a one-state solution, while a few felt the urge to label themselves “Jewish” before comparing Israel to Nazi Germany. 1. How can Achcar claim that the Palestinians had no responsibility for the Holocaust? The Arabs had persuaded the British to shut the door of British Mandate Palestine to Jewish immigration leaving the Jews to their fate at the hands of the Nazis. (There was also the 1937 Peel Commission which offered the Jews just 20% of British Mandate Palestine. Had the Arabs accepted even more Jews would have escaped the Nazis). Achcar told me that all nations had shut their doors to the Jews including “racist Britain”. Evenso, that doesn’t absolve the Arabs from all responsibility for the Holocaust! 2. Israel does bear little, if any, responsibility for the 1948 Nakba as UN Resolution 181 created two states; one for the Jews and one for the Palestinians. The Arabs rejected it and chose war instead. Achcar countered that the Palestinians had a right to resist the takeover of “their country”. 3. Jews were not treated well in Arab countries. They were dhimmi (tolerated and protected but subordinate) and one million were expelled after Israel’s creation compared to the 750,000 Arabs that left British Mandate Palestine/Israel. There was also the Farhud of 1941 during which 175 Iraqi Jews were massacred. Achcar answered that it was debatable as to why the Jews had “migrated” but it was nothing compared to the fate of the Palestinians. He also said that despite being dhimmi Jews had always fared better in Arab and Muslim countries than in Western countries. 4. As for Nazification if anything it was the Arabs who were doing this of Israel with slogans like “Stop the Holocaust in Gaza” and talk of Palestinians in concentration camps. Even Nur Masalha had just mentioned concentration camps. Masalha replied that it was the British who invented concentration camps so he, of course, was not referencing the Holocaust. Achcar did however dispute Masalha’s astonishing claim that the Mufti was not an anti-Semite. He said the Mufti was anti-Semitic as evidenced by his radio broadcasts from Berlin inciting Muslims to kill the Jews wherever you find them. But, Achcar said, this had all come to nothing anyway. 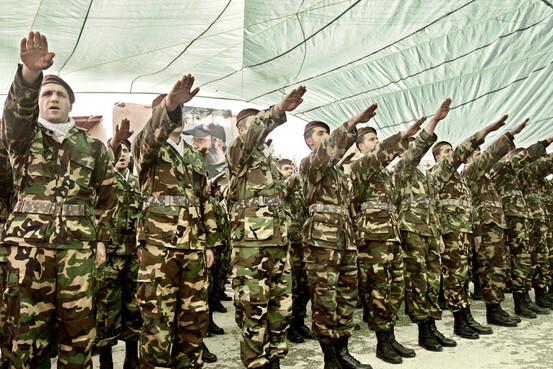 Hizbollah fighters: According to Gilbert Achcar the Nazi salutes are purely down to Israel's behaviour. However, I would suggest, it isn’t the Holocaust that keeps Israelis locked in a state of fear but these murderous pronouncements of intent by the Mufti which have been taken up by Hamas and Hizbollah. The Hamas Charter explicitly calls on Muslims to kill Jews and Sheikh Nasrallah, the head of Hizbollah, said that “if all the Jews gather in Israel it will save us the trouble of going after them worldwide”. But not once were Hamas or Hizbollah even mentioned. There was no acknowledgment of any Jewish connection to the Land of Israel. There was no acknowledgment of the ethnic cleansing of one million Jews from Arab countries who had to leave everything behind them. Quite incredibly, all three speakers painted the Arab nations, and the Palestinians in particular, as innocence personified. The only thoughtful comment came from Idith Zertal. She agreed that some Arabs do Nazify Israel but felt that Israelis invented this type of the Nazification. However, she felt it was now important for both sides to find other words to describe the Arab-Israeli conflict. The Holocaust was a unique tragedy and there is no place for such comparisons today. Finally, after two long hours, some sense was spoken. This entry was posted in anti-Semitism, Holocaust, Israel and tagged Arabs, auschwitz, David Ben Gurion, gaza, Gilbert Achcar, Holocaust, Idith Zertal, Israel, Mohammad Amin al-Husayni, Nakba, Nur Masalha, palestine, Peel Commission, Poland, soas, The Arabs and the Holocaust: the Arab-Israeli War of Narratives, UN Resolution 181, west bank. Bookmark the permalink. Anti-Zionists are rushing to publish undercooked and under-researched polemics in the guise of history in order to jump on the delegitimization bandwagon which is gaining speed and offers financial and academic rewards to those who get with that program. Increasingly we see one-sided ‘panels’ offering unanimous, or nearly unanimous indictments of Israel — witness Geoffrey Alderman’s experience in Belfast. Some of the recipients were outed a few years ago but the investigations seemed to vanish. A state of innocence equates to childhood really-since no responsible adult can claim to be no more than an innocent bystander. It reflects a rather juvenile mentality,to my mind, to keep apportioning blame elsewhere rather than to look closer to home. The teaching of history is up for grabs and the Jewish experience is steadily being eroded/undermined. Richard, Thanks for going to these horrid gatherings and speaking up in such a hostile atmosphere. Why wasn’t a pro-Israeli representative invited to be on the panel at the SOAS – if it’s about Arabs and Israelis facing up to anything? Arabs and Jews who hate Israel are not 2 sides getting together, are they? That was Idith Zertal. She said she is pro-Israel and she did speak out against a binational state and spoke of the need for people to stop using “Nazi”, but she could have done more. She agreed with the outlandish claims made by her two fellow panelists. It seems clear to me from a commonsense reading of this passage [Babylonian Talmud, Tractate Sanhedrin, folio 73a] that the concept of a rodef encompasses those who advocate or incite the murder of Jews. Every Gazan citizen who voted for Hamas must – surely – come within this category, because Hamas as a movement is explicitly committed to the destruction, not simply of Israel, but of the Jewish people. I read the conversation and the 186 mainly irrelevant comments – or at least those that were left after “moderation”. Alderman wins: he knew what he was talking about: scripture as applied to an event that was over or almost over. I forget the dates. I do disagree with him on Tony Martin but again there was a ludicrous point on his parole hearing, that a prison officer prevented parole by claiming Martin was a danger to burglars. I would hope to be a danger to burglars but wouldn’t shoot them in the back. Cod psychology of the worst sort, which says more about the speaker than anything else. The logical choice of reviewer for Ashcar’s work is Martin Gilbert. He is expert in holocaust, Zionist, Arab and Islamic Jewish history. He has never been asked. The Arabs are responsible for Nazi holocaust becuase they did not accept more jewish refugees to Palestine? The Arabs should have voluntarily made themselves refugees and homeless , handing over everything to the Jewish refugees in order to avoid charge of being held responsible for the Holocaust? Delude yourself Richard Milett if you must but making such ludicrous claims does no favours to your own credibility! But is a false equivalence?, isn’t it? Did accepting Jewish refugees turn other nationals into refugees? Nearly half a million Jews had managed to settle in Palestine on far less land and far more efficiently. You imply that somehow Palestinian Muslims and Christians were less obliged to take Jewish refugees than others. I think the reverse is true: having believed Jews to be a people exiled and dispossessed for their rejection of Jesus and the prophets, and dispossessed from just about everywhere else since, I think they were among those most obliged to grant refuge. Certainly not to side with the persecutors of Jews, or promulgate persecution themselves. I think there is a great deal of evidence that Hitler and Nazis were very popular among Palestinian Arab Muslims and Christians. That doesn’t mean they were responsible for the Holocaust. But they were responsible for exacerbating its negatives for Jews. Aschar’s work does sound like a bit of a whitewash, intended to answer in the negative a very limited question i.e. Were the Arabs responsible for the Holocaust, while mitigating very widespread sympathy for Nazi and European fascist policies towards Jews, later imported into the Arab world, and applied to Arab Jews. I understand your point and I never said they were responsible for the Holocaust. I was simply disputing Achcar’s claim that the Arabs had “no responsibility at all”. Clearly they did by having the doors of British Mandate Palestine closed in 1939 and by rejecting a Jewish state on 20% of the land in 1937. Additionally, I think you will find that the Mufti’s effectiveness in raising troops to fight for the Nazis is understated by Achcar. 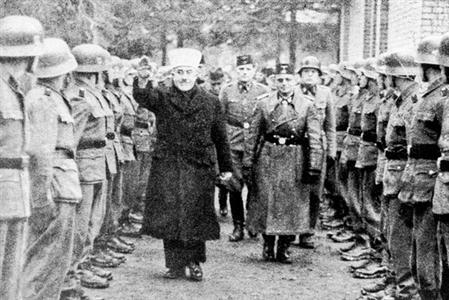 In Spring 1943, the Mufti of Jerusalem, Mohammad Amin al-Husayni, (aka Amin al-Husseini), was invited by the Nazis to assist in the organizing and recruiting Bosniaks into the Waffen SS and other units in Yugoslavia. He was escourted by SS Standartenführer Karl von Krempler, who also spoke fluent Turkish. the Mufti successfully convinced the Bosniaks to ignore the declarations of the Sarajevo, Mostar, and Banja Luka ulema (Islamic clerics), who in 1941 forbade Bosnian Muslims from collaborating with the Ustaše. Croatian Foreign Minister Dr. Mladen Lorkovic suggested that the Division be named “SS Ustasa Division”, not an SS Division but a Croatian unit raised with SS assistance, and that its regimental names be given regional names such as Bosna, Krajina, Una etc. Grand Mufti Mohammad Amin al-Husayni, alongside SS Brigadefuhrer Karl-Gustav Sauberzweig, greeting Bosnian SS volunteers together with Nazi officers in November 1943. The British were in charge of British mandate Palestine and not the Palestinians but again I cannot see what obligations they had to accept Jewish refugees. The US Authorities forced the return of jewish refugee Ship from Miami back to Nazi Europe where some of the jewish refugees perished under the Nazi barbarism while others managed to escape safety to England and other countries. There was the Palestine regiment composed of Arabs and Jews who fought the Nazis in North Africa. Haji Amin was not the only leader of the Arabs or Palestinians during the second world war. The handschar division was disbanded a few months due to desertations. Nor was Amin the only leader to go to Nazis during second world war. Sadat who was later inprisoned by the British for seeking help from Nazi Germany , S Bose (president of Indian Government in exile) also sought help from Hitler and Nazis. Bose formed division of Indians to fight along the Nazis. “Now that the ship could not dock in Cuba, Captain Schroeder sailed it to the Florida coast. There he hoped that the United States would admit the passengers. Desperately trying to avoid a forced return to Germany and certain death, the passengers – more than 400 of whom were women and children, and many of whom actually had quota numbers to eventually enter the United States – sent a telegram to Roosevelt asking for help. They received no reply. The State Department sent word that it would not interfere in Cuban affairs and refused to allow the passengers to come ashore. In fact, even as the ship was entering Florida’s territories, the Coast Guard had fired a warning shot in its direction. The captain knew that there was no choice but to turn back toward Germany. There are four Arab interpretations of the Holocaust. If you are ‘lucky’ you might encounter all four in the same pamphlet. 1- Straight Holocaust denial. It’s all a conspiracy to blackmail Europe. 2- Victimology Palestinians are suffering for crimes they had nothing to do with. 3- Divine retribution on the Jews for the crimes they would commit on the Palestinians in the future It actually makes sense in Muslim theology. Remember Muhammed was the last Muslim prophet – not the first. 4- Hitler should have finished the job Does this need any explanation? all are to blame so nobody should be blamed? leaving the perpetrators aside for a moment to whom of course always the first and only blame must go I find that none of the non-perpetrators has a really stellar record, but that in my book doesn’t mean that they are all excused, quite the contrary. We should be told a lot more about effective help provided and easy help available denied. It is fashionable to go after the US and the Brits with these arguments but it should be as legitimate to go after the others. And since I’ve read that Arabs peddle the argument that they can’t be anti-semitic because they are semites themselves one could add the blame that they on top of everything left their “family members” unhelped, which come to think of it seems to be a habit, because that is exactly what they have been doing to Palestinian refugees since 1948. German law knows something that is called “unterlassene Hilfeleistung” (unprovided help) – I am told it is applicable, if you see a car in a ditch with a person in it on a lonely road and don’t do your best to get help or help yourself. So Richard is perfectly in his right to focus on Palestinian Arabs, they may be singled out with as much and as little justification as every other non-helper or miserly helper may be singled out on occasion and btw is again and again. It’s disgusting (from either side) that nearly 50 years after the events the Holocaust still has to be ‘discussed’ in the context of the plight of the Palestinians. In what way are modern day Palestinians somehow responsible for the idiocy of the Grand Mufti and the rather minimal effect he had on the Holocaust? The answer is not at all. It really would be ‘more logical’ (even though still deeply illogical) to blame the many European countries that harboured considerable numbers of Nazi collaborators but of course I don’t see Richard do that. Instead he has to bring up something that no Palestinian child born into refugee status can even remotely be held responsible for. Yet once again Israel and Zionism has to be absolved completely of any crime or misdemeanor. Richard, you’ll be glad to know I’ve only come here this time to subscribe and immediately unsubscribe from your entire Ultra Far Right, Conservative Zionist propaganda rag. This post really did it for me. Bye and all the best. Gert, i didn’t bring this up. Achcer did. Am i not allowed to respond and give my views? Achcer wrote a book. You want me to nod my head and sit there tight lipped? I don’t hold anyone responsible but the Arab leaders, and other international political figures, at the time who took major political decisions. That is why, with regard to the Arabs, I cited the specific decisions taken in 1937 and 1939. If someone gave a speech saying that the British and the Americans had no responsibility whatsoever for the Holocaust I would have responded the same. or maybe he has decided that a fluent in four languages computer geek chemist director might be better off giving up on “between-jobs” “projects” and try a bit of gainful employment for a change.